During these cold wintry days, you may not be thinking about invasive species. Maybe you should be. While we await warmer weather -- the type conducive to walking beaches, boating or swimming on our inland seas -- invasive species are being shipped around the world; they are stowing away in cargo or are hidden in bait buckets. Others go unnoticed, invisible on our clothing, boats and even our pets that have been in lake waters. This problem sneaks up on us. Often hidden by water, invasive species are aquatic "hackers" -- silent criminals whose ill effects soon become all too obvious. Now, the problem is full on. It overshadows and overwhelms good work being done to protect our national treasure, the Great Lakes. Over the past several decades, invasive species have developed into an enormous challenge for the Great Lakes; a challenge that affects all of us. Policy-makers and resource managers are still struggling to address this complex and often controversial subject. What are we jeopardizing if we do nothing? Consider the economics. There are more Michigan residents who fish and hunt than who attended Detroit Pistons games in the 2007-08 season (1.37 million vs. 905,000). They spend $9.4 million per day (more than $3.4 billion annually). The 46,000 jobs supported by this spending provide $1.7 billion in salaries and wages, $406 million in federal taxes and $378 million in state and local taxes, with a ripple effect of $5.9 billion to our state’s economy, according to the Congressional Sportman's Foundation. More than 180 invasive species have been introduced to the Great Lakes, resulting in a significant cost to you. Millions of dollars in lost fishing opportunities, millions more in infrastructure costs for utilities and cities. Behind the numbers, it’s personal. You catch the invasive round gobies instead of perch. You turn with disgust from the public beach fouled with algae. You pay the hidden tax we all pay for the cost of treating utility water intake pipes for zebra mussels. You notice our once-beautiful shoreline views are choked by invasive phragmites. Are there any solutions? Rigorous scientific research data has provided us with tools to stop new species from invading. We know the primary pathways invasive species use, including maritime commerce, recreational activities, organisms in trade and canals. We also know much about what to do. Our state has played a leading role for the past two decades. In 2005, the Michigan Legislature enacted the nation’s first state ballast regulations, providing both protection of our own waters and driving faster action on federal regulations. We are taking other steps in collaboration with our partners. I represent Michigan on the Asian Carp Regional Coordinating Committee. I’m also proud to be a member of the Great Lakes Commission, which has teamed up with the Great Lakes Cities Initiative to prepare a study on how to separate the Mississippi River watershed from the Great Lakes watershed. This important work complements federal agency work on this same topic and will provide the information needed to make decisions about preventing movement of invasive species, including Asian carp, between these two great basins. The commission’s study results are due out at the end of this month. All of us engaged on the Asian carp problem are eagerly awaiting the proposed solutions. I want to end my story on a positive note. Everyone can play a part in solving the problems. If you enjoy going to the beach, boating or fishing, remember, as you move from lake to lake - clean, drain, and dry your beach toys, boat, equipment, and gear after each use. If you work in a water-related business, take all precautions to prevent spread of aquatic invasive species. We have much to thank our Great Lakes for -- and we need to return the favor by being their outstanding stewards. What a great article! I particularly liked your call to action - we can all play a part in helping to prevent the spread of invasive aquatic species. There has been a trend over the years to cut taxes and government spending at both the state and federal level, a trend with which I do not agree. A lot of the inspection for health and safety on the job has now been turned over to the employers themselves, a sort of self-monitoring. A recent article in the Detroit Free Press told of Michigan losing one of its crime-fighting forensic specialists to another state for higher pay. My question is: Are we trying to maintain our Great Lakes and rivers and streams "on the cheap"? Are there sufficient inspectors to enforce laws against pollution and invasive species, and are they adequately paid? To do any less would jeopardize our natural habitats and lose the very reason why so many tourists come to Michigan. Any that would be penny wise and pound foolish. 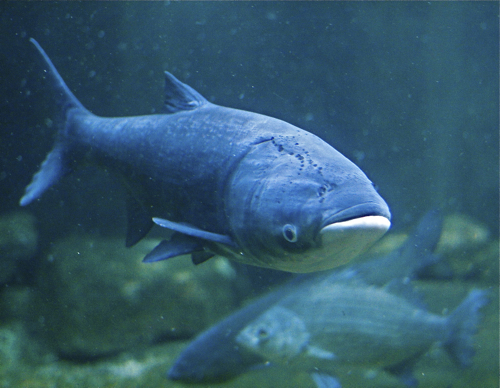 The Asian Carp is featured in this article. It is knocking on the Great Lakes door. Part of the solution is in the Chicago area and the closing off of the likely path for the fish to enter the Great Lakes. But politics and some lopsided economics stand in the way. I would encourage the author and those who read this article to contact their represtatives on the state but especially the federal level to remedy the situation in the Chicago area before, as the article states, it is too late. This may only be part of the solution regarding the Asian Carp, and I realize there are other invasive species, but as the previous comments mention, are we trying to solve things "on the cheap"? There are tremendous concerns at stake and the stalling and lack of action by our reps, and other Great Lakes state reps, is inexcusable. It's interesting that the same President who has no problem shutting down the Keystone XL pipeline for environmental reasons, can't shut down the Chicago Sanitary canal. I guess that says a lot about his political interests, the petroleum industry, his Chicago cronies and how much he really cares about the Great lakes. And don't let him hide behind and try to buffalo Michigan with that Army Corp of Engineers won't let me crap, he is the Commander in Chief! Regarding Asian carp why do we not take advantage of the knowledge that the carp do not like loud underwater noises? Use loud engines or underwater speakers playing "Heavy Metal". Collect all the carp that jump into the boat and sell them to Asian restaurants in Chicago. Setup freezer depots to collect the carp. What we are trying to do is over-fish to extinction. I commend The Bridge for providing Ms. Birkholz a forum for discussion of these menaces. While the Asian Carp is the high-profile invader du jour, and rightly deserves attention, discussion, and funding to battle it, I'm pleased to see the reference to invasive phragmites. Even the casual observer cannot escape this rapidly spreading plant: it is now everywhere in southeast and mid-michigan, typically in large, deceptively beautiful patches of tall, brown, tufted "wheat" resembling the ornamental grasses found in many suburban landscapes. The problem is, however, that the invader's rhizome/root structure chokes out and replaces the native cattails in wetlands of all kinds and sizes, from drainage ditches to ponds, lakes and rivers, eventually drying up the water and driving out the fish, birds, amphibians, and other species that make those wetlands desirable and valuable. This has, unfortunately, gone on for years, and anyone who takes the time to look will see more and more phragmites, and fewer and fewer wetlands, cattails, red winged blackbirds, frogs, dragonflies, etc. I encourage everyone reading this to contact their legislators about taking action to reverse these losses. The Asian Carp are the most efficicient Filter feeders (planktivores) in the world, according to Duane Chapman expert. We had filter feeders get in before, overran the lakes, dominated the food and eat native larval fish, were 90% at one time. The cause was said to be lack of predators due to overfishing. These fish did not grow too big for predators, and only spawned once per year. (Versus Asian Carp, too big, spawn 3 to 4 times per year) Predators were stocked to control these invasive filter feeders, they are called alewives. We have several native predators for juvenile Asian Carp, sufficient numbers is all that's required to control them. Or do we repeat history?